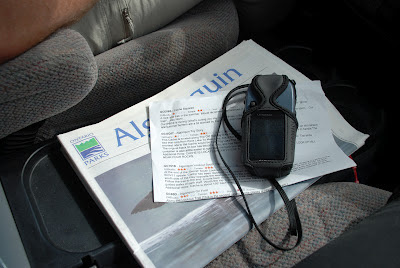 A few years ago we bought a handheld GPS to help stay on the right path when we hit the trail. Sure, it works for that. But more often we’ve found ourselves using it to dive head first into a game that takes us off the trail, sometimes has us wandering in circles and always helps us discover places and spaces outdoors that we never knew existed – sometimes right in our own neighbourhood. What’s this game? It’s called geocaching and it’s a real-world outdoor treasure hunt. Geocaching is world-wide pursuit. There are over 2,751,675 active geocaches and over 6 million geocachers! I’m happy to report that nine of those geocaches were hidden by me and my family in Guelph, Ontario. To play, you look for geocaches in your area (or any place you want to explore) on the geocaching.com website or app. And then you head outside and use a GPS-enabled device to navigate to a specific set of GPS coordinates to try to locate hidden containers called geocaches. When you find the cache, you sign a log-book in the container and, if the container is large enough, leave a little treasure of your own choosing behind. It takes hiking, biking or just a nice walk outside to a completely new level. The very first time we hit the trail looking for geocaches, we found ourselves just 15 minutes away from home. We knew the area, but had never visited it until that crisp, winter Sunday. We were amazed to find three treasure boxes filled with dollar-store goodies, hidden in nooks and crannies along the trail. We were even more amazed to find a secret staircase leading, literally, to nowhere. After getting home from our geocaching adventure, I did a bit of research and learned the staircase was a remnant of the homestead that used to be on the property. The house had been demolished years ago, but before that happened I remembered seeing it from the road as a kid. It was very cool to learn about the house and family that helped settle my hometown in it’s earliest years. If it weren’t for the game of geocaching, I would probably never have learned about the trail, the staircase and a bit of local history. 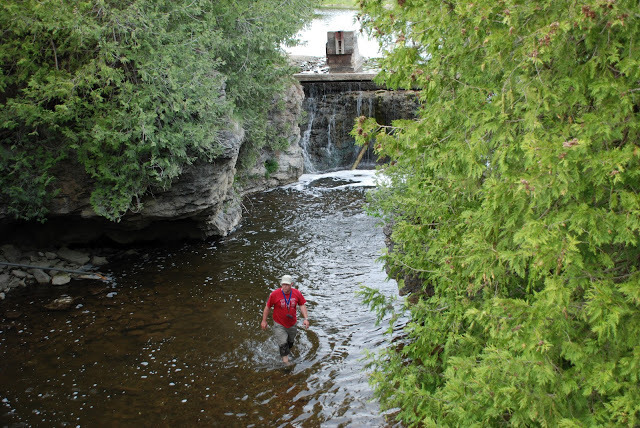 Since that first day playing the game, we have found over 400 geocaches across Ontario. 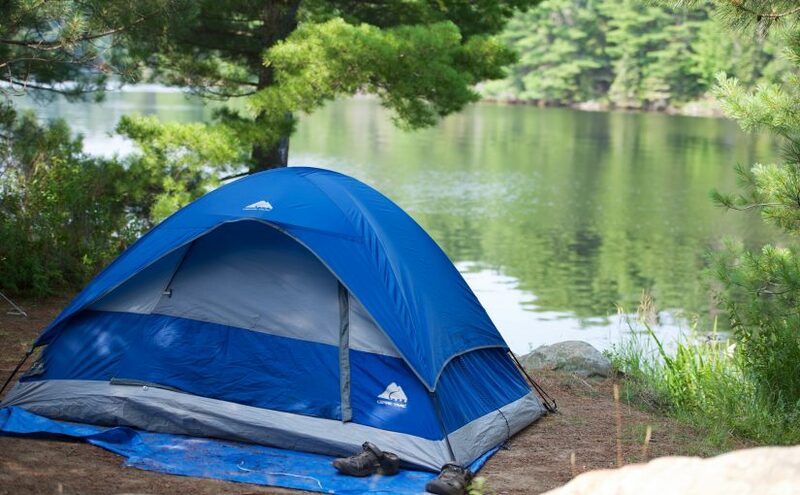 We’ve found them in Conservation Areas, Provincial Parks, local parks, on trails in urban, wild and rural areas. We’ve discovered trails in our city that we didn’t know existed. We’ve explored villages and towns we would probably never have visited, if there wasn’t a geocache to be found. We’ve climbed trees, paddled our canoe and even walked on (frozen) water to find a geocache. And we discovered that the game of geocaching is a great way to get kids excited about getting outside and engaged while on the trail. Geocache containers come in all shapes and sizes, from “micro” to large plastic containers. We’ve found geocaches that are made from food coolers! Most containers are a colour that blend-in with their surrounds. 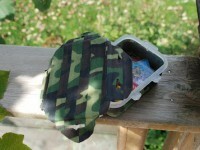 Camouflage is a geocachers favourite colour. 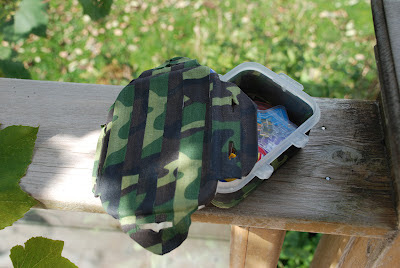 Most caches are home-made and many were put together with inexpensive materials but loads of creativity. While many caches contain a variety of treasures with no real rhyme or reason, some caches are made with a theme in mind. We found a book-themed cache in The Massasauga Provincial Park this summer. It contained books and playing cards, where you traded a book of your own for one in the cache. The one thing in common with all caches is the log book or paper found inside. Once you find a cache you need to sign your name and then log your find on the geocaching.com website. The great thing about geocaching is that just about anyone can do it in any season. It can be a group activity, a family hobby or an individual pursuit. There really aren’t any rules about who plays the game. 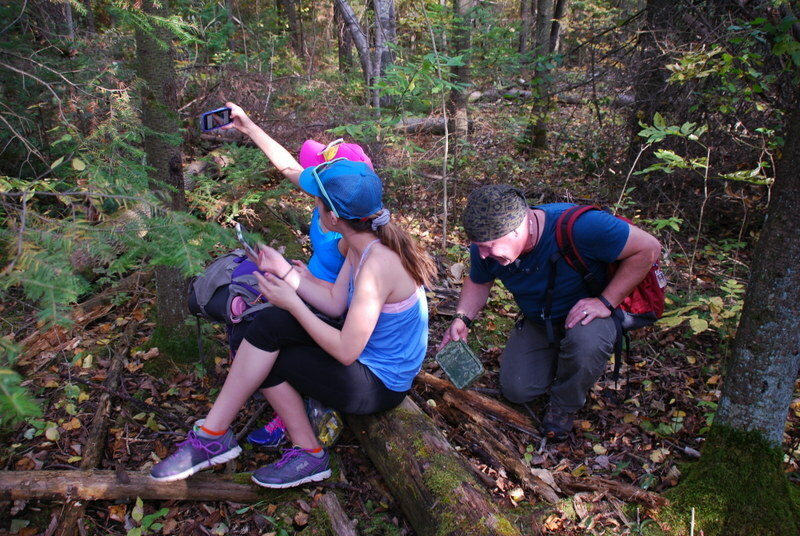 While the majority of my geocaching adventures happen with my family – we have an account to represent all three of us – I have searched for caches while hiking my favourite local trails on my own. I have also teamed up with work friends to hide and find caches, and even set-up and led a geocaching hike for my daughter’s Girl Guide pack. It’s an all ages, all abilities game. There are even caches hidden that are accessible for people who may have physical challenges. All you need to do is read the geocache description at geocaching.com to find out if that particular adventure is right for you. Geocaching can be a very low-cost game. Mobile phones are equipped with GPS and a basic geocaching app can be downloaded for free. Once you discover how much fun the game is, you can upgrade to a paid membership to gain access to a great number of geocaches. Of course, like any hobby, you can drop a fair amount of money into the game if you choose to purchase a GPS device and higher-end trinkets to add to your geocaches. But ultimately, the choice is yours on how much money you invest in the game. Log your experience at geocaching.com. Geocaches must always be family friendly. Don’t leave anything in a cache that you wouldn’t want your mother or toddler to see or touch. Be respectful of all the land, buildings and people in the area surrounding the geocache. This is just a little description of geocaching. I could write paragraphs more about travel bugs and challenges and geocoins. And then there are the events and meetups that happen. And there’s also the tips on what you should ALWAYS carry with you when you go geocaching. But I don’t want to completely overwhelm you with all of this right now. 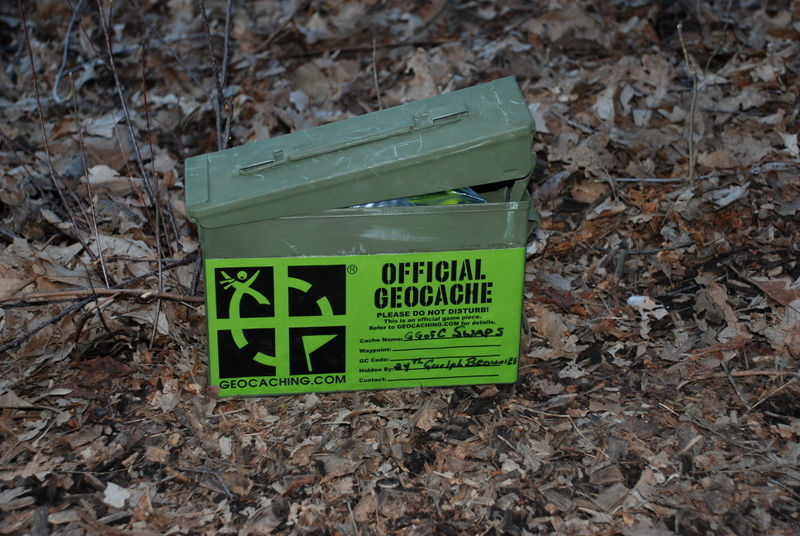 The biggest thing you need to know, is that geocaching can be addictive. And once you start playing you will never look at the landscape around you again. There are secret treasures everywhere. Under rocks, in trees, sometimes in plain site and sometimes far from probing eyes, there are puzzles to be solved and secret spaces to search. And they are within your reach if you know how to look for them. It all starts at geocaching.com. 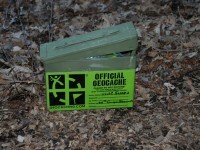 Check out the website to learn more about geocaching and sign-up for a free, basic membership. Then, get outside and start caching!